Nulla cursus massa semper velit posuere cursus. The aim of the "Green Mines" network is to promote all aspects of mining (industrial, technical, social and human) within the European Atlantic Area. 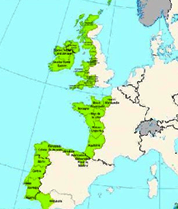 It includes 10 partners from five countries, the United Kingdom, Ireland, Portugal, Spain and France, brought together by the "ATLANTERRA" project (2010-2012). Through Green Mines – ATLANTERRA, the experiences of activities offered in former mining sites, regarding conservation and development can be shared; archives and documentary heritage can also be pooled. Mining activity and its related industrial activities have contributed towards the social, cultural and economic development of all human societies in Europe since the dawn of prehistory. This intrinsic relationship is self-evident and is even reflected in the names that European societies chose to give to the early stages of development in the history of man: Stone Age, Bronze Age and Iron Age. This relationship continued over time and is still present today creating a rich social and cultural heritage that brings together the European peoples.